As a Minnesotan I grew up on modified hotdish. For those of you are not from the Land of Lakes, hotdish is most commonly served at family dinners and church potlucks. Hotdish can come in a variety of forms but the commonality is that it is a one pan meal usually featuring some sort of cheese and meat. True life for his birthday my brother used to request Tater Tot Hotdish. Since the cold weather has rolled in it only seemed appropriate to make a classic midwestern dinner. 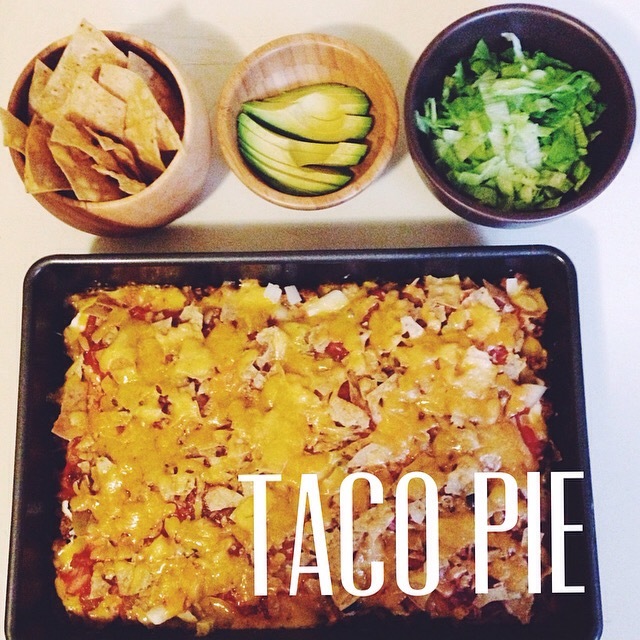 We tried a healthier twist on this taco pie recipe that I had growing up. Subbing greek yogurt for sour cream, adding green chili for a little flair, and ground turkey instead of regular ground beef. Begin by laying down the unrolled crescent rolls flat in the bottom of a greased 9 x 12 pan. With the oven on 375 degrees bake the flattened rolls for 10 minutes. While rolls cook, brown turkey in a medium-sized pan. In another pan brown the yellow onion. Once the meat is browned combine the onions, taco seasoning, and 3/4 cup of water. Bring to boil. Then let simmer, stirring occasionally for 5 minutes. Once crescent rolls are cooked, add meat and onion mixture on top. Then add the layer of greek yogurt on top of the meat. Next add back beans spread evenly across the pan. Then layer the green chili. Next a layer of cheese evenly spread on the pan (about 1 cup). Then a layer of salsa, followed by a layer of crushed tortilla chips, and again a layer of cheese to top it off. Top with shredded lettuce, avocado, and extra salsa. This entry was posted in cooking and tagged fall dinner, hotdish, Taco Pie. Bookmark the permalink.